When trying to assess gold prices, it’s critical for investors to pay close attention to the Dow-to-gold ratio. At its core, the ratio says how many ounces of gold it would take to buy one share of the Dow. It’s a powerful ratio when valuing gold prices. Currently, an ounce of gold costs around $1,300 and the Dow stands at around 23,000. With this, the Dow-to-gold ratio stands at around 17.6. Looking at the long-term averages, the Dow-to-gold ratio says there could be a massive move to the upside in gold prices. The long-term average of the Dow-to-gold ratio since the 1970s is around 13.06. Assuming this ratio comes back to its historical average, and assuming the Dow stays at the current level, gold prices would have to increase to around $1,750. This ratio was around 13.0 not too long ago, so it’s not out of the question for it to get there again. In 1980, the Dow-to-gold ratio approached 1:1 (one ounce of gold was nearly equal to one share of the Dow). If that happens again, gold prices would have to be much higher. Even assuming the Dow drops by half, gold would have to be more than $11,000. 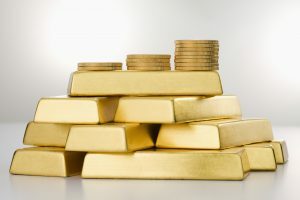 For gold prices to hit $11,000, a lot will have to happen: a major economic crisis, world war, or outright collapse of fiat money. However, $1,750 could happen. We’ve seen it before, and it’s not difficult for markets to digest; it’s just $450 higher than where it currently sits, or 34%. A 34% increase in the gold price could cause some gold mining stocks to double or triple, however. That’s where the big rewards could be. Over the past few weeks, gold and gold mining shares have been punished by investors. They are currently presenting a great opportunity that could generate massive returns for investors over the long term.